Abstract: This paper proposes a hierarchical control scheme based on the definition of a set of multi-robot task functions. To deal with the inherent conflicts between tasks, a strict hierarchy is imposed to them. We present a novel scheme that copes with two main difficulties shared in standard task-based controllers: 1) to impose a desired time convergence of tasks; 2) to avoid discontinuous task transitions occurred when a task is inserted or removed in the hierarchical structure. As a result, continuous input references are generated for the low level control of the group. 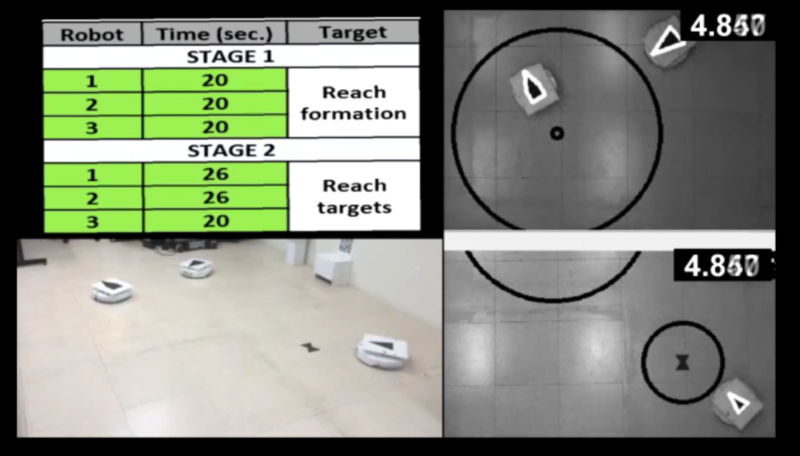 The validation is achieved in simulation and by performing an experiment with wheeled mobile robots.